영주 무섬마을은 조선시대 중기인 17세기 중반에 입향시조*인 박수(朴燧)와 김대(金臺)가 들어와 자리를 잡은 이래 반남박씨와 선성김씨의 집성촌으로써 유서 깊은 전통마을이다. 또 일제강점기에 뜻있는 주민들에 의해 건립된 아도서숙은 항일운동의 지역 구심체 역할을 한 곳으로 우리나라 독립운동사에서도 중요한 의미를 갖고 있다. 무섬마을은 물 위에 떠 있는 섬을 뜻하는 수도리(水島里)의 우리말 이름으로 삼면이 내성천과 접해있는 전형적인 물도리 마을로 마을 앞을 돌아나가는 내성천은 맑고 잔잔하며 산과 물이 태극 모양으로 서로 안고 휘감아 돌아 산수의 경치가 절경을 이룬다. 마을 내에는 해우당고택과 만죽재고택 등을 비롯하여 규모가 크고 격식을 갖춘 'ㅁ'자형 가옥, 까치구멍집**, 겹집***, 남부지방 민가 등 다양한 형태의 구조와 양식을 갖춘 가옥이 있어 전통 주거 및 민속 연구의 귀중한 자료로 가치를 지니고 있다. Museom Village in Yeongju was established by two men, Park Su and Kim Dae, during the mid-17th century; since then, it has continued to be occupied by the descendants of the two, who founded the Bannam Park and the Seonseong Kim Clans. In the village is a private academy called Adoseosuk, established during the early 20th century when Korea was under the Japanese colonial rule and which became the home of local patriotic fighters against Japanese Imperialism. The name of the village, Museom, literally means “island,” suggesting that it is enclosed by a river, Naeseongcheon, on three sides. 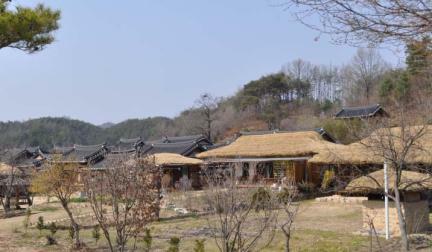 In the village are old houses exhibiting different styles including the comparatively large historic houses once inhabited by aristocratic families of mid- and late Joseon such as Haeudang and Manjukjae Houses, houses with “magpie holes,” “winged houses,” and others, providing valuable information on the distinctive features of traditional Korean houses.